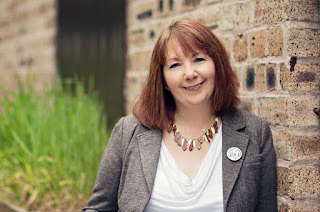 This month's author is Sandra Ireland. I first met Sandra at Bloody Scotland in September last year and we recently met up again when we went to see Stephen Watt at StAnza. I'm delighted to be interviewing her for my blog. Your first novel, Beneath the Skin features a man with post-traumatic stress disorder and a taxidermist. What made you choose these aspects of their characters? The taxidermist came first. I watched a documentary with taxidermy artist Polly Morgan, and she was saying that when she’s introduced to someone, she’s actually checking out their bone structure when she shakes hands! I thought this would be a brilliant quality for a character, so Alys the taxidermist was born. Walt came slightly later. He was a bit bland at first, but once I realised that he was suffering from something you can’t see, his personality came to life and the whole concept of the story became obvious. 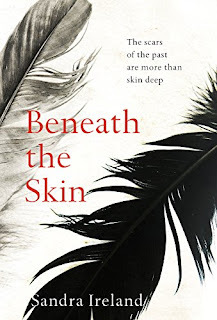 The scary things are out of sight - Beneath the Skin. What are you working on at the moment? Amazon says it’s another psychological thriller. What else can you tell us? It’s called The Bone Harp, and its central character is an old watermill; a place which will keep you awake at night! The novel is a very contemporary tale of sibling rivalry, betrayal and guilt, based around an old Border Ballad entitled Two Sisters. The sisters in the ballad are both in love with the same man, which leads to dark deeds by the mill pond. In the present day, the mill is derelict, but human emotions rarely change, so when my protagonist Lucie has to write down this folk tale, life soon begins to imitate art…or is it all in her imagination? I was very fortunate to receive funding from Creative Scotland to undertake a year-long residency at Barry Mill, Angus, in order to write this novel and to study the landscape of the mill. This National Trust for Scotland property has provided me with endless inspiration, and I think readers will be intrigued by such an unusual and creepy setting! I’d been writing articles for my local paper, but to be honest, fact is rarely as interesting as fiction. When my mum died in 2007, I started to write as a kind of therapy. Even though I’d been very coy about all my teenage forays into writing, it turned out that she was my biggest fan. She always believed that I’d be a writer, a fact I only found out a year or two before she passed away. I suppose she wasn’t from a generation which felt comfortable around imagination, and no one in my family had ever been to university, or been involved in the arts in any way. That sort of spurred me on, and I suppose my first (frankly awful and still unpublished) novel was a wee tribute to her. Tell me more about this first novel? Any other finished books in a drawer? This first novel was called World’s End, and was about a mismatched bunch of people who go on a wild goose chase to Ireland in search of treasure. It contains every cliché you can imagine and is definitely going no further than my bottom drawer! After that, I wrote a YA novel about the Children of Lir, an Irish myth, which was better but in need of improvement. I’m still working on it, but one day…! You were one of the “Crime in the Spotlight” authors featured in “Bloody Scotland” in 2016. What are your favourite memories from the event? It was such a surreal and slightly bonkers experience! I remember that I went to the wrong venue initially - I ended up in one of the hotels and a Who’s Who of agents, publishers and writers were checking in. I just stood there and thought, “Wow - I’m really part of this?” And it did very much feel like being a part of something. Everyone was so kind and genuine, especially my fellow “Spotlighters”, who I’m delighted to say I’ve kept in touch with. The actual experience of sharing a stage (however briefly) with Lin Anderson, Doug Johnstone and Louise Welsh is one I won’t forget in a hurry! BBC Radio 2 because I don’t sleep well and end up listening to Vanessa Feltz at 5 a.m.! James Bond, but only if I could lecture him on feminism, equality and how to make his own Martinis. Biro. I buy black gel pens from a certain rather nice stationers, and was once told they were about to be discontinued. Worst day ever, that’s how fond I am of pens! Pen and paper? Or digital? For my 100th post... meet "Hero"